A slab leak is a plumbing term for a pinhole leak that appears in a copper water line running beneath the your home’s foundation. Slab leaks are also known as base leaks or solid slab leaks. These leaks usually are often difficult for homeowners to detect until severe damage occurs. Slab leaks require special tools for our plumbers at Rodger’s Plumbing to locate the source of the leak. Rodger’s Plumbing fully insured plumbers use the best slab leak detection equipment to locate the source of the leak. A home with a weak foundation can be very dangerous. Our plumbers will find your leak fast and efficient with minimum damage to your homes foundation. We offer slab leak detection plumbing services to residential and commercial estates. There are four identified causes of slab leaks in residential areas including insufficient piping and fittings, water strain, unstable substructures and chemistry of water and piping materials. Customers can prevent slab leaks under their home’s foundation by maintaining proper water pressure in their homes. Also, regular plumbing inspections performed by Rodger’s Plumbing will help ensure that there are no issues under your concrete slabs. Rodger’s Plumbing has a long history providing Slab Leak detection plumbing services to Dallas Texas including the following towns of University Park, Highland Park, Coppell, Farmers Branch, Addison, Carrollton, Plano, Richardson, North Dallas, Allen, Garland, Sachse, Wylie, Murphy, Rowlett, North Mesquite, North Irving, Mckinney, Hebron, and Frisco. 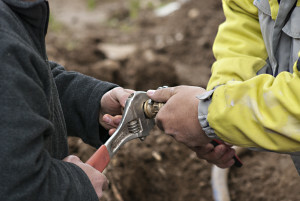 Our plumbers are committed to providing our customers with fast and excellent plumbing services. The Plumbers at Rodger’s Plumbing are fully insured and professionally trained to find the source of a slab leak to repair it. Call our plumbing company today (972) 931- 1021. Most pricing can be quoted by phone upon request. Same day service frequently available. We Are In Your Neighborhood!